The WDT is similar to the Master Clear External Reset as it will hold a PIC® MCU in reset when activated and place the Program Counter back to the beginning of the program software (org 0). The WDT is activated when its time-out period is exceeded. It is a free running timer independent of the main system clock. If the operation of the code in the device is affected by an external source that causes the software to deviate from its expected path, the WDT may be able to reset the device automatically depending how the reset is used in the design. The software designer can place instructions to clear the WDT counter and prevent a WDT reset from occurring. It's when those instructions are not executed, such as when an external interference affects the proper operation, that the WDT will engage and reset the device. The WDT can be enabled or disabled in a configuration setting or even under software control. The WDT is essentially a counter that is incremented on each clock pulse. The prescaler can be set to a value that determines the number of clock pulses to cause the reset. When the WDT is cleared, the counter in the prescaler is cleared back to zero and the time count starts all over. The RWDT = 0 and TO = 0 bits in the Status register will be cleared when a Watchdog Timeout Reset occurred during normal operation. Two bits in a configuration register control the mode for the WDT. Those bits are the WDTE bits shown below. The WDT is always operating when this mode is selected, even during sleep. The WDT is on except when the device is put to sleep when this mode is selected. The WDT can be enabled or disabled in software when this mode is selected. The SWDTEN bit of the WDTCON register can be set or cleared to enable or disable the WDT. The WDT is disabled and cannot reset the device. The WDT derives its time base from the 31khz Low Frequency Internal Oscillator (LFINTOSC). This oscillator runs independently of the system clock (unless the LFINTOSC is selected as the system oscillator as well). 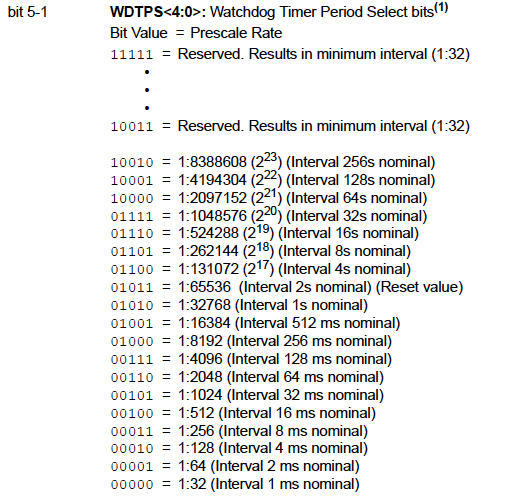 The WDT timeout can be set with the Watchdog Timer Period Select Bits (WDTPS) in the Watchdog Timer Control Register (WDTCON). Five bits select the timer period ranging from 1 Millisecond to 256 seconds. The Register and WDPTS bits are shown below. Unlike other reset options, the WDT can be prevented form occurring via software control. This occurs by clearing the watchdog counter before it hits the timeout mark. The WDT counter can also be reset by other means automatically. All of these conditions, except for the clrwdt instruction, automatically clear the WDT counter. When the device enters sleep mode the WDT counter is cleared. If the WDT is enabled for operation during sleep then the WDT counter continues incrementing on each clock pulse. When the device exits from sleep mode the WDT counter is reset again and continues counting if enabled. When the WDT times-out in sleep mode, a reset will not reset the program counter but instead just wake the device up from sleep. Operation will continue at the instruction placed after the sleep instruction that put the device into sleep mode originally. The POR = 0 and TO = 0 bits in the Status register will be cleared to indicate a wake-up from sleep was caused by the WDT time-out.